5/8" x 150' New England Polyester Double Braid **Blue** Hank. 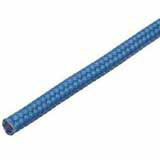 New England's double braided polyester is a strong and extremely durable construction. Ideally suited for controlled lifting and rigging operations where high strength, low elongation and excellent abrasion resistance are required.